Rebekah Barnes is one-half of the Sarasota-based husband-and-wife personal training team that my wife and I have been training with since this past Fall. She’s a very enthusiastic person who’s a walking encyclopedia of health food and fitness. We’ve been extremely happy with our results while working with her and I was more than happy to help her revamp her online presence. To the right you can see the before and after screenshot. The old site was made of static HTML files that were named based on some arbitrary index (1.html, 2.html, etc.). The formatting was inconsistent across all of the pages, as was the navigation. The footer links did not match up with the pages they were linking to. The text was a hodgepodge of fonts and sizes, without use of any semantic elements such as headers or lists. As you can see from the image the layout also did not scale very will with the center image repeating on large screens. Under the covers the HTML itself was invalid, and it appeared that FrontPage was used to assemble the pages. The new site uses a highly readable font (Calibri when available, otherwise Arial or Helvetica) with a large base font size and line spacing. All of the elements are written with semantic HTML, with the Blueprint CSS framework assisting with layout. All of the images from the old site were re-used after being optimized, and some URL rewrite rules were put in place to redirect requests from any of the old pages that may have been book marked. jQuery is used on the Rates page to implement the tab functionality. I also setup Google Analytics and Google Webmaster Tools accounts to track page view statistics and fine tune the content for Google’s indexing bots. Behind the scenes the pages use PHP (the html extension is mime-typed to PHP on the server) to manage the common areas of the layout and process incoming form submissions. The shopping cart functionality is managed through PayPal. Over all I’m pretty happy with the result. As far as the design goes this is pretty much as far as I could take it on my own, but Rebekah seems to be very happy with it as-is. It’s certainly an exponential improvement over what she had previously. 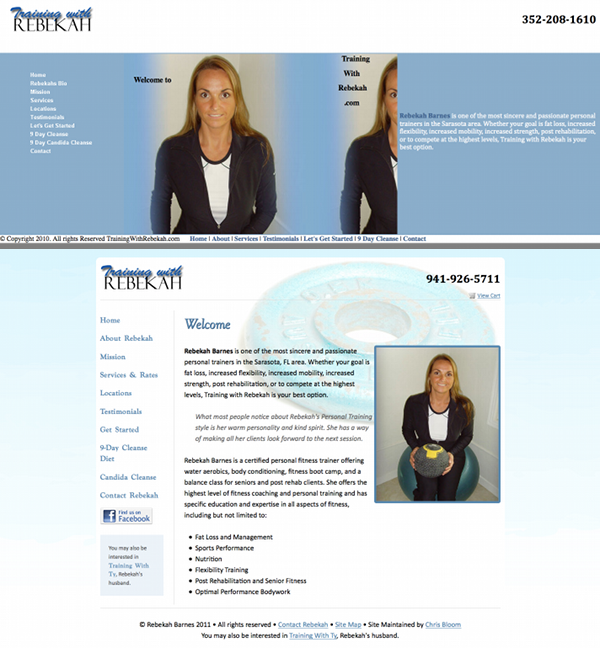 If you’re looking for personal fitness training in the Sarasota area, even if you’re just here for a week or two on vacation, I highly recommend Rebekah. Please give her site a read through to find out if she’s a good fit for your needs and goals.